Scientists from the XENON collaboration now announced the result from their search for the elusive component of our universe known as dark matter. 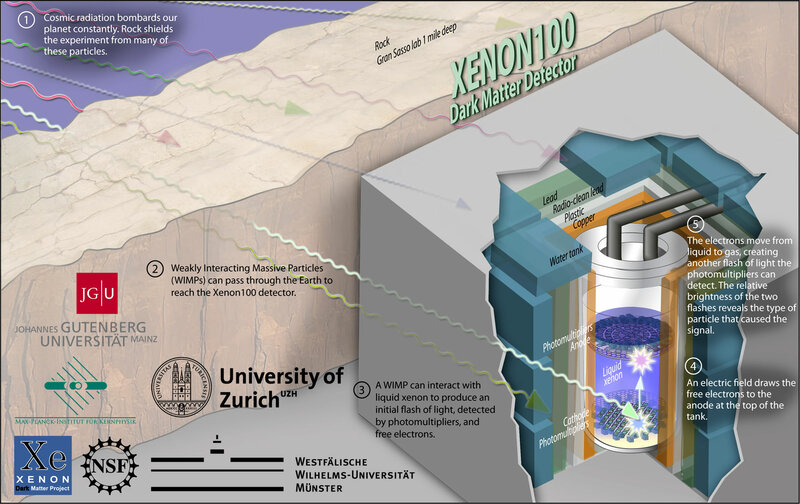 After analyzing 100 days of data taken with the XENON100 experiment, they see no evidence for the existence of Weakly Interacting Massive Particles (WIMPs), the leading candidates for the mysterious dark matter. The XENON100 experiment is operated deep underground at the Gran Sasso National Laboratory of the INFN, the National Institute of Nuclear Physics in Italy. While the group observed three candidate events, they expected two from background radiation. These new result translates into the highest sensitivity reported by any dark matter experiment to date, and serves to further constrain the new physics models for particle dark matter, which will help target future WIMP searches. A direct observation of WIMPs would link the largest observed structures with the world of subatomic particle physics. While no detection can be claimed yet, the level of sensitivity achieved by the XENON100 experiment may allow an actual detection in the near future. XENON100 is an ultra-sensitive device, with specially designed layers of water, lead, copper and other shielding, including liquid xenon scintillator, to filter out radiation and other sources of energy that could cause a false signal. This is also why the experiment is located beneath a mile of rock and Earth - these materials help shield the detector from cosmic radiation that is constantly bombarding Earth. The XENON100 detector uses 62 kg of liquid xenon as a WIMP target, and measures the tiny charge and light signals that are expected from rare collisions between WIMPs and xenon atoms. Xenon - the same noble gas used to make those ultra-bright car headlights that have a bluish tint - is condensed to liquid form to become three times more dense than water, and is used in this experiment because it has a large nucleus that WIMPs can collide with. When such a collision happens, it creates a bluish light and a charge that scientists can detect with highly sensitive cameras positioned at each end of the detector. Cosmological observations consistently point to a picture of our universe where ordinary matter as we know it makes up only about 4%, while new, yet unobserved forms of so-called dark matter and dark energy make up the rest. This is consistent with ideas on small scales, too, since attractive extensions of the Standard Model of particle physics suggest that exotic new particles, which are perfect dark matter candidates, exist. This makes Weakly Interacting Massive Particles of interest to both cosmology and particle physics. A search for WIMPs is thus well motivated and a direct detection of such particles is the central missing piece of information to confirm this new picture of our universe. New data from the 2011 run and the collaboration's plan to build a much larger experiment with 2,500 kg of xenon in the coming years promise an exciting decade towards the solution of one of nature's most fundamental mysteries. The XENON collaboration consists of 60 scientists from 14 institutions in the USA (Columbia University New York, University of California Los Angeles, Rice University Houston), China (Shanghai Jiao Tong University), France (Subatech Nantes), Germany (Max Planck Institute for Nuclear Physics Heidelberg, Johannes Gutenberg University Mainz, the University of Münster), Israel (Weizmann Institute of Science), Italy (Laboratori Nazionali del Gran Sasso, INFN e Università di Bologna), Netherlands (Nikhef Amsterdam), Portugal (Universidade de Coimbra), and Switzerland (Universität Zürich). XENON100 is supported by the collaborating institutions and by the National Science Foundation and the Department of Energy in the USA, by the Swiss National Foundation in Switzerland, by l'Institut national de physique des particules et de physique nucléaire and La Région des Pays de la Loire in France, by the Max Planck Society and by the German Research Foundation [Deutsche Forschungsgemeinschaft], by the Weizmann Institute of Science, by the German-Israeli Minerva Gesellschaft and GIF in Israel, by FOM in the Netherlands, by the Fundação para a Ciência e Tecnologia in Portugal, by the Instituto Nazionale di Fisica Nucleare in Italy and by STCSM in China. Graphical description of the XENON100 results. The horizontal axis represents the mass of the dark matter particle, the vertical axis shows its probability to interact with ordinary matter. The area above the blue curve is excluded by the new XENON100 data. The grey regions show theoretical predictions from supersymmetry, taking into account recent constraints from the LHC. 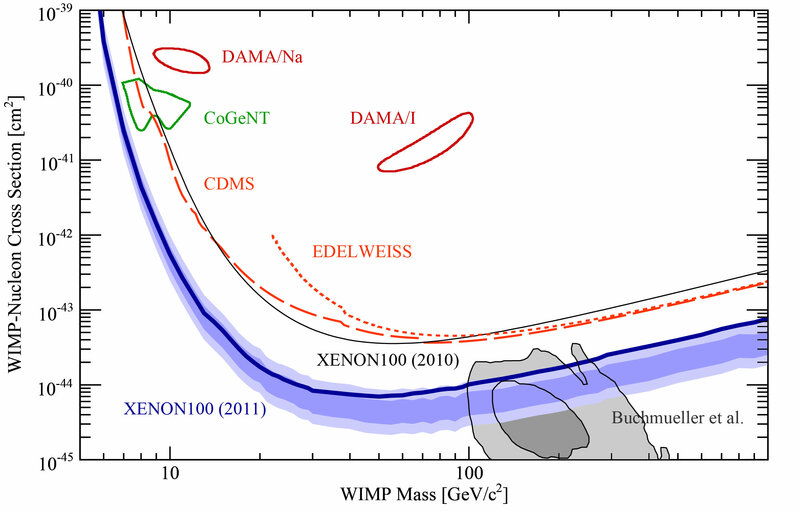 Exclusion curves from the competing dark matter experiments CDMS (in the US) and EDELWEISS (in France), and two regions from experiments claiming a dark matter signal, CoGeNT (in the US) and DAMA (in Italy), are also shown.